Chukotka: Where Russia's day begins. Getting our bearings on the way to the Bering Strait. After about an 8-hour flight (much of which took place over the Arctic! ), I arrived at Anadyr airport. For every hour flown we crossed one time zone - and then some, because Anadyr has a 9 hour time difference with Moscow. In fact, although it is only a 90 minute flight across the Bering Strait from Nome, Alaska, the time difference is a whopping 20 hours! Can't say I envy my fellow expeditioners who have crossed the international date line from North America – getting over the jet lag will be no easy task. I imagined Anadyr airport to be a tiny little building at the end of a long runway but instead it was a modern, medium-sized terminal with all the features and facilities you would expect to find in an airport of its size. Abramovich's tenure as governor of Chukotka really left its mark on the region! During the Soviet times, some of the more remote regions of Russia were closed off to both tourists and Russians alike. Chukotka was and, to a certain extent, still is like this. Even though it was a domestic flight, there was passport control on the way out. Unless you are registered here in Chukotka, Russian citizens need to have an invitation or a statement of purpose to explain their need to come to Chukotka. Why exactly this is I'm not sure. A fellow Russian voyager speculated that perhaps the USA's proximity has something to do with it... Luckily, Heritage Expeditions took care of all that for me and the other expeditioners, so all we had to do was collect our suitcases and make our way out from arrivals. As it's not freezing cold, we did not get to make our way to town from the airport via an ice road as is usually the case from the months of January to May since the airport is located across the Anadyrsky Liman. Instead, we took the ferry breathing in that crisp and pristine Arctic air. 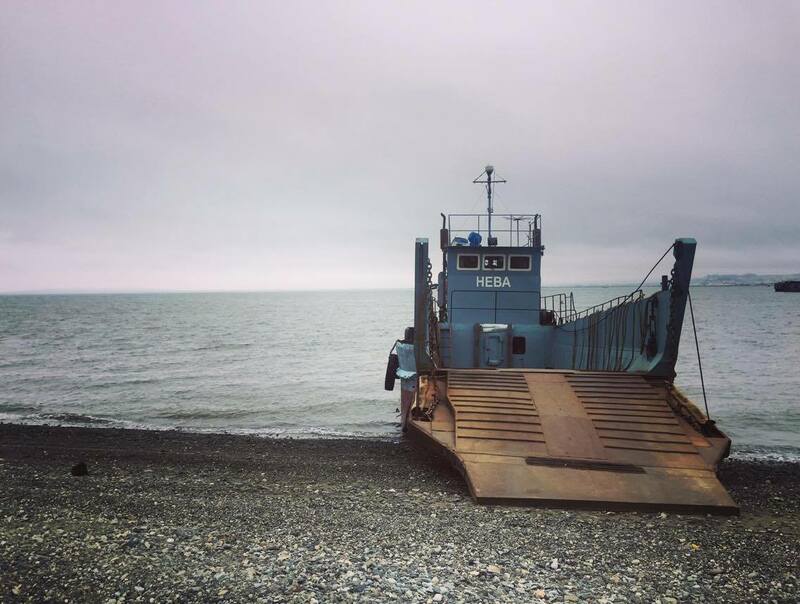 The transit from the airport to the Spirit of Enderby (or Professor Khromov as the Russian crew members call it) that Heritage Expeditions employs for the two-week "Chukotka: Where Russia's Day Begins" adventure went as smoothly as possible given the remoteness of the region. The scenery was splendidly desolate – think Andrei Zviagintsev's "Leviathan" – and the feeling of civilization began seeping right through my fingers as we left the airport further and further behind. Suitcases and passengers were taken aboard a rickety old ferry and straight onto the vessel. Unfortunately there was no time to explore Anadyr, the administrative capital of Chukotka and Russia's easternmost town. I was pretty excited about seeing the Holy Trinity Cathedral - the largest wooden church in Russia - but I have a feeling that we will get to see many amazing things on this trip that will surely top a big wooden church. We had a bit of time after boarding to get our bearings (before heading towards the Bering Strait – no pun intended!) prior to an introduction to the crew and general orientation. I am no expert in these boats as this is my first ever expedition, but it looks like one of those vessels you imagine Jacques Cousteau to have worked on. The cabins are simple but comfortable. After all, we're all here for the extraordinary nature, not a luxury cruise. The food, I must say, is 5-star all the way with two chefs cooking away and catering to our every whim. The crew is multinational and the amount of experience and expertise they have between them is truly unparalleled in expedition travel. After having heard and read so much about him, I finally got to meet Rodney Russ, the fascinating man that set up Heritage Expeditions and by doing so, made it possible for so many groups of adventurers to explore the oh so remote Russian Far East. A New Zealand native, Rodney started off his career at his nation's Wildlife Service before founding a small business that focused on conservation advocacy. His first visit to Russia happened in the late 1990s, several years after he'd chartered his first Russian vessel. And it was love at first sight: Rodney immediately felt an affinity with the Russian people, their history and the country's incredibly diverse and beautiful nature. After years of working together Rodney and his team built a very strong relationship with the Chukotka Region, making Heritage Expeditions the only expedition cruise with permission to take tourists here. It's not difficult to imagine just how lucky I feel right now to be one of the very few to see this region! Conservation and education is at the heart of Rodney's work. In his view, unless we share the stories of these amazing people, plants and animals there is no other way to truly preserve the unspoiled corners of our planet. Rodney knows he's acing it when he gets repeat business. As he says, once people have been to Russia it gets under their skin, they find themselves wanting to travel more and see it all – a view echoed by the entire crew on board. Not surprising: as a very seasoned traveler, Rodney can say with certainty that for the wildlife and adventure there is no place like here anywhere else in the world! So, tomorrow first stop - Egvekinot. Let's put Rodney's words to the test!